Written by Leslie Sand, the play is set in a Blackpool boarding house during the 50s it is run by the formidable Mrs Austin, helped by her hopelessly romantic maid Florrie. During this eventful week at the seaside, a mismatch of patrons try to enjoy themselves. 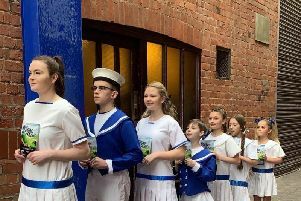 In their number are two dancers from the pier end show, a Yorkshire couple and their daughter who are constantly in contact with the mother left at home with the chickens, and a honeymooning pair. Hilarity ensues and you will be sure of a good time at the Seaview - two minutes from the sea! Tickets cost £8 for VIP, £6 for adults and £5 for concessions (under 16s and over 65s). For more information, you can visit the Bispham Castaways website and buy tickets that will be delivered to your door, email bispham.castaways@gmail.com, phone 07469726832, or visit the Facebook page.